AS the ten days between Rosh Hashanah and Yom Kippur come to a close, we stand again at metaphorical thresholds of life and death; a time of reckoning, so to speak. Do we carry on with our thoughts and behaviors as though they are beyond reproach or do we confront and excise those that are detrimental to our moral and spiritual development? There is no easy answer nor am I qualified to moralize to anyone even if there were. Yet, I think that if we accept the opportunity to make these choices, we must acknowledge that we are far less than perfect and remind ourselves that regardless of our beliefs in destiny, fate or free choice, we are creatures of habit. And habits, by their very nature, are powerfully addictive. It is the act of excising strong cultural addictions with the intention of a nation’s spiritual cleansing that drives this week’s Torah narrative in Parashah Va-Yelekh. In the process, we meet the prophetess Huldah, a unique intelligence far ahead of her times and Josiah, an idealistic king whose actions remind us that while destruction is often dramatic and ugly, it must become the foundation for a nation whose spiritual roots will run deep beneath the various practices of monotheism. In Israel, during the 7th century rule of King Josiah, grandson of Manasseh, Hilkiah, his high priest, discovered a scroll, later identified as Deuteronomy amidst some debris in the Temple. Following the cultic corruption of the land during the time of Josiah’s father Amon, the priest had been directing an altar and idol destruction campaign to re-establish Judean control over Israel. When he brought the scroll to King Josiah, they discovered that it contained predictions of great catastrophe on all of Israel for ignoring its commandments. This frightening find then prompted Josiah to seek further counsel to guide him in the social and political reformation that restoration of monotheism would require. In her commentary to Parashah Va-Yelekh, Rabbi Rosette Barron Haim suggests that in handing down the Torah in the generations after Moses and Joshua, it was necessary to choose an individual who could not only transcribe and administer it, but who possessed a deep understanding of its meaning. Although the well-known prophet Jeremiah was alive at that time, the king gave the scroll to the prophetess Huldah. He is shown here with shadowy broken idols falling from hands while he listens intensely to Huldah’s interpretation. In her wisdom, she tactfully tempered her responses to ease the King’s fears, yet encourage him to act swiftly. Curious to know more about this extraordinary woman, I found that Huldah was said to have administered an academy of learning under the influence of Rabbi Akiva’s academy in Mishneh (the second quarter of Jerusalem). 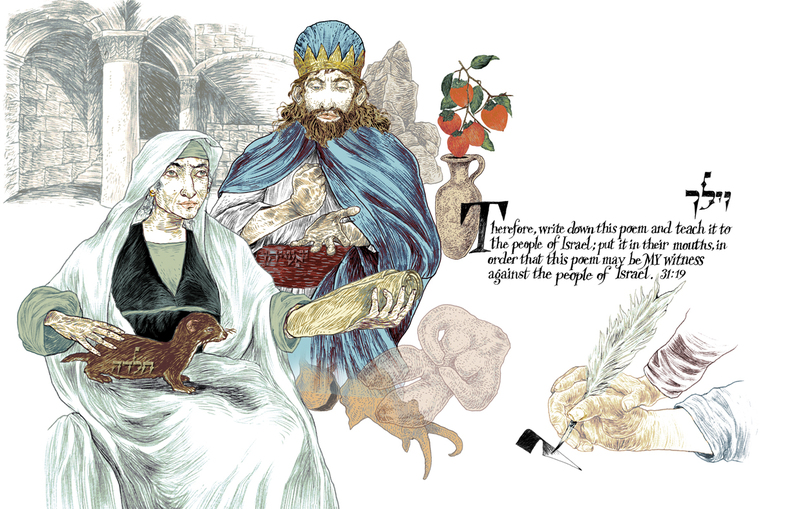 Because both institutions held that a man is obligated to educate his daughter in Torah, it is easy to understand how her authority would have inspired the actions that secured King Josiah’s prominent role in the history of the monarchy of Israel. I was also intrigued to learn that during the 2nd Temple period, there were two gates in the south wall of the Temple Mount at Jerusalem known as the ‘Huldah Gates’. These gates, under the Al-Aqsa Mosque, led into underground tunnels on the way to the Temple Mount and alledgedly to Huldah’s academy.The architectural image at the upper left of this spread was drawn from this bit of information. As for her odd name, Huldah in Hebrew means ‘weasel’. While this doesn’t seem very flattering, it turns out that many cultures associate this small animal with archetypal feminine qualities and great intelligence, going so far as to credit a weasel as midwife in the birth of the Greek hero Hercules. I have portrayed her in her advancing years, her mythical associate on her lap; gazing into a future that only she can see. Emerging from the clay amphora near the quotation is a branch of fruit resembling persimmons. This odd detail was suggested as I read about the discovery of the first Israelite settlement at Ein Gedi in the 7th century during the reign of the kings of Judah.A strange plant, perhaps the persimmon, grew there in abundance. This plant exuded a fragrant resin that was collected and processed into a legendary perfume. King Josiah is credited with originating the closely guarded formula for ‘persimmon’ oil that was used to anoint new kings. The final image on this spread illustrates the future implications of the quotation. Two hands, young and old, hold a quill pen and are drawing the Hebrew letter ‘vav’. This is from the formal ceremony known as ‘Siyyum HaTorah’. It is enacted when the writing of a scroll of the Law is completed. Traditionally, the final eight verses are left unwritten or set down only as outlines so that guests who are invited to this event may perform the important mitzvah of participating in the scroll’s completion. This entry was posted on September 21, 2012 at 9:49 AM and is filed under Imaginarius Updates. You can follow any responses to this entry through the RSS 2.0 feed. You can leave a response, or trackback from your own site. I don’t. Each time I publish a post, I am reminded of how much I don’t know. But thanks for your kind note.